To say I was devastated would be an understatement. I was pissed off and could not sit by idly any longer. Now I don’t know if SI was nice enough to send this cover to the people in the Pittsburgh area as I am not a resident there any more. But if they did, well congratulations SI, you’ve successfully satisfied a small fraction of your hockey fans and insulted the rest. Now, over the years I have gotten used to hockey being forced to the back burner by every other major sport in America. It gets nowhere near the coverage of football, baseball, or basketball and I’ve had to learn to accept that. But this was the Stanley Cup finals and one of the most exciting finals series in years. And still, it got snubbed by SI and by ESPN. Now, ESPN tried to throw a bone to hockey fans by, when possible, leading off their late edition of Sports Center with coverage of the finals, but a look at that coverage shows a different story. The history making victory by the Penguins in game seven garnered a whopping 7 minutes and 13 seconds of airtime on Sports Center following the game. And that was with a cup champion being crowned and no NBA games as competition. Now, game six went head-to-head with game three of the NBA finals. That night, the SCF received 9 minutes and 24 seconds of airtime. Can you believe it? Game six got more attention then game seven. Meanwhile, game three of the NBA finals got 42 minutes and 32 seconds of coverage on Sports Center once that game ended. That’s over four times more coverage! But wait, it gets worse. The unopposed game five blowout by the Red Wings got only 6 minutes and 25 seconds of coverage. And, game 4 received 6 minutes and 26 seconds of air versus 49 minutes and 57 seconds for game one of the NBA finals. That is somewhere in the neighborhood of eight times more coverage! Thanks to Sports Business Daily for supplying these jaw dropping numbers. Now, let me get up and brush myself off, because I’m not done. The fact that the NBA finals got more coverage on ESPN was not all that surprising to me. It was the difference in the amount of attention that a five-game yawnfest where the Lakers demolished the Magic received compared to, arguably, the best seven game Stanley Cup finals series in almost 40 years. And the worst part of this slap in the face by Sports Illustrated is that the cover picture is awful. It is not worthy of a championship edition. But before we start lighting torches, the disrespect by SI is not finished. You see, every time a major sports championship is handed out, Sports Illustrated offers its “Championship Package.” This usually consists of a hardbound commemorative edition, DVD, and some sort of championship memorabilia. I know this because SI is currently advertising their Lakers championship package. I find it interesting, however, that there is no Penguins championship package. Once again hockey gets the proverbial shaft from a major sports medium. Well, that’s about all I can take of this. When my subscription to SI runs out this winter, I will not be renewing. And I urge hockey fans everywhere to write to voice your outrage to SI as well. Send them an email, snail mail, or a picture or your backside with the caption “kiss this.” Something so they know that hockey fans are out there and they demand to be heard. While you’re at it, send something out to ESPN as well. They need to know that we demand hockey be given the respect it deserves. In the famous words of Howard Beale, "I'm as mad as hell, and I'm not going to take this anymore!" 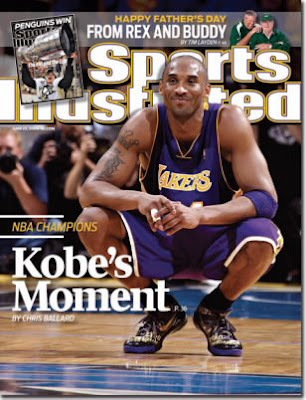 We were looking to get a copy of SI JUST for the Pens and were turned off by the Kobe cover. (and the tiny inset, AND having to flip to the back for the story) sad, sad stuff. my only thought is this, print media as we know it is dead, just ask the boston globe. So SI has started this regional cover thing, in pittsburgh we got the cover, in Detroit they got Kobe...etc. Email me and i'll get you a SI with Sid on it. My sister is home for the summer (in Eastern PA) and thought for sure she'd get the Kobe cover but was thrilled when not only did she get the Sid cover, but she had an easier time finding a few more in the store out there than I did! Thanks everyone for your concern and assistance. Sometimes it is very difficult to be so far from da 'burgh. I cancelled my SI in 1991 or 1992, I can't rememeber which year. They had Michael Jordan on the cover for an NBA quarter final win the week the Pens won one of the Cups. I don't think that I have bought the magazine more that a few times since then.